Apostolos Nikolaidis Stadium, also widely known as Leoforos, was the first proper football stadium to be built in Greece. It opened in 1922, but it took until 1928 for the first stand to be built. During the first half of its existence, Leoforos also was the standard playing venue of the Greece national team. Apostolos Nikolaidis Stadium recorded its highest attendance in 1968 when 29,665 attended a Cup Winners’ Cup match between Panathinaikos and Bayern Munich. By the 1980s, the stadium was slowly falling into disrepair, and in 1984 Panathinaikos moved to the new and much larger OAKA Olympic Stadium. 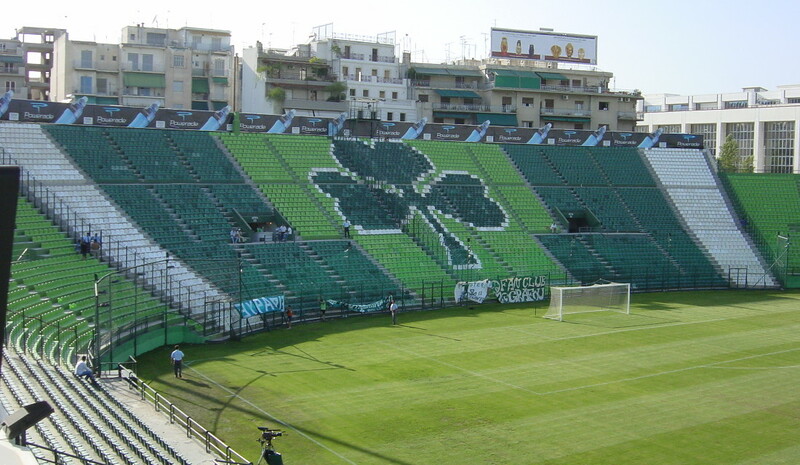 They kept playing at the OAKA until in 2000 the stadium closed to get upgraded for the 2004 Olympics, and moved back to Leoforos, which received a refurbishment to make it fit to host matches again. Following the Olympics, Panathinaikos moved back to OAKA Stadium and at the same time started exploring the possibilities to build a new stadium, focusing on the Votanikos district. 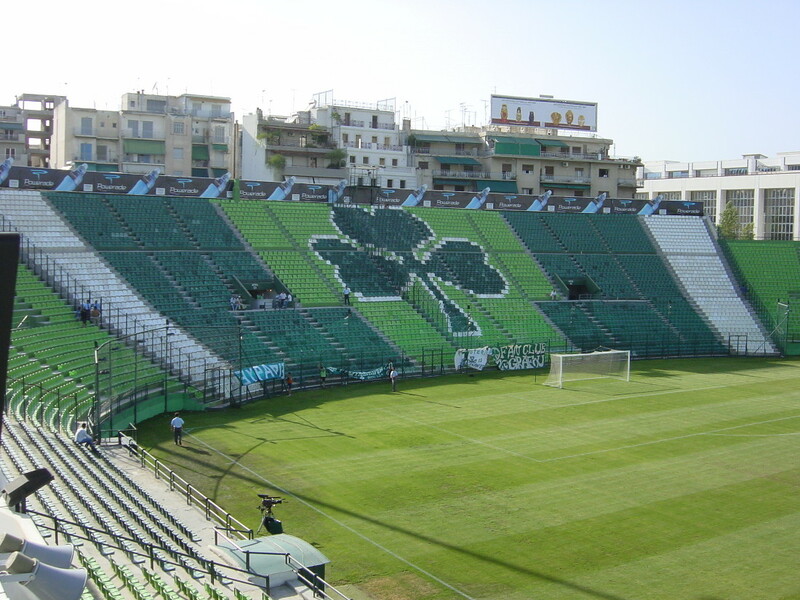 These plans led to nothing though, and in 2013, being unhappy at the much-too-large OAKA, the club decided to move back to their traditional home. Since 2013, Apostolos Nikolaidis Stadium has undergone several minor upgrades, and the club intends to gradually further refurbish the stadium and expand capacity. Apostolos Nikolaidis Stadium is located in central Athens, roughly 2 kilometres north-east of the city centre. The walk from Syntagma Square takes about half an hour. Alternatively, metro station Ambelokipi lies right near the stadium. Ambelokipi is on the M3 line that runs from the airport to the city centre, stopping, among others, at Monastiraki and Syntagma stations in the city centre. Apostolos Nikolaidis Stadium lies in central Athens in a busy mostly residential area mixed up with some offices and shops. It won’t be too hard to find a local place to get something to eat or drink, but the stadium isn’t too far from Athens’ pleasant centre either. There are plenty hotels at short walking distance of Leoforos. Athinais Hotel, Airotel Alexandros, and Airotel Stratos Vassilikos are all just south of the stadium at less than 5 minutes walking and get good reviews. There are furthermore a few well known chain hotels 10 minutes further south including a Hilton, Crowne Plaza, and Best Western. To the west of the stadium you can furthermore choose out of hotels like the Zafolia Hotel and Dryades Hotel, both at easy walking distance. Click here for an overview of hotels near Apostolos Nikolaidis Stadium, or here to explore other options in Athens. Panathinaikos tickets can be bought online through viva.gr, in person at the ticket office at Leoforos, or through any of the viva sales points (vivaspots). Central vivaspots include the Reload store on Leoforos Eleftheriou Venizelou 54 in the north of Athens’ city centre and the My Market store on ΠΑΡΘΕΝΩΝΟΣ 4-6 just south of the Acropolis Museum. Tickets tend to go on sale 4-5 days before the match, though in the case of high-profile matches this might be earlier. Panathinaikos rarely sell out a regular league match. Expect to pay from €15.00 for a seat behind the goal to €60.00 for the best seats at the main stand for a regular league match. Seats for the sides start at €25.00. Prices are higher for the derbies, starting at €25.00 and ranging up to €120.00. Pao.gr – Official website of Panathinaikos FC.